A couple weeks ago we mentioned at the bottom that you can edit your knowledge graph via a tip from @ChrisGDunn. Well, it has been showing up more. In short, if you are the representative of a knowledge graph box/card for a company, profile, product or service, Google may show you the option to "suggest a change." Those changes that are made there reportedly happen within 24 hours. That is at least according to Aaron Bradley and Bill Slawski who gave it a try after I covered the news. @bill_slawski @rustybrick @sengineland Ditto here - heard back within 24 hrs. When you click suggest an edit, you can make changes and supposedly when those changes are made, the updates happen very quickly. We've seen many cases of wrong or inaccurate information showing up in the knowledge graph, so this is a nice way to get them fixed. 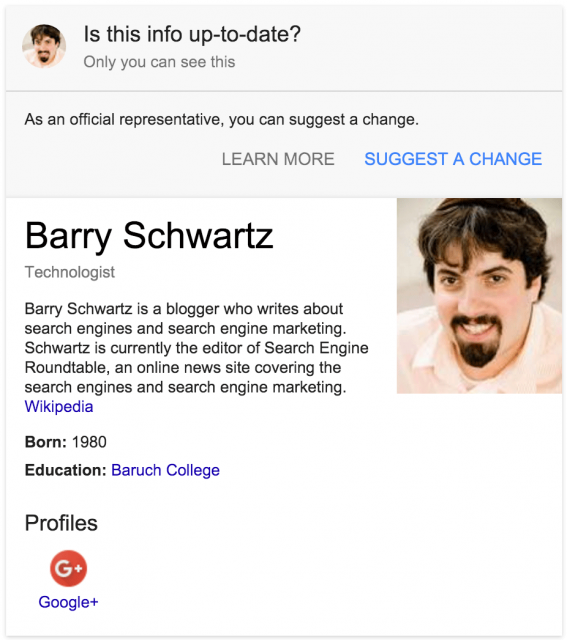 The Knowledge Graph card includes the topic's official website, YouTube channel, or Google+ page. You're an owner of the online presence (the topic's official website, YouTube channel, or Google+ page) that appears in the card. In some cases, if you're an owner of a topic's online presence, you might also be an official representative for related topics, such as a parent company and its subsidiaries. You're signed in to Google with the account you use as the owner of the topic's online presence. It is great to see Google reacts fast to these change requests.